By Tom Roberts. Video by Alex del Olmo. I’m Tom Roberts, my dad brought me on the Seven Seas for the first time. It was my first time on a sailing boat and it was really special boat because it wasn’t any ordinary boat it was an Buginese pirate boat. Even better I had to miss two weeks of school other though dad made me do homework every day. 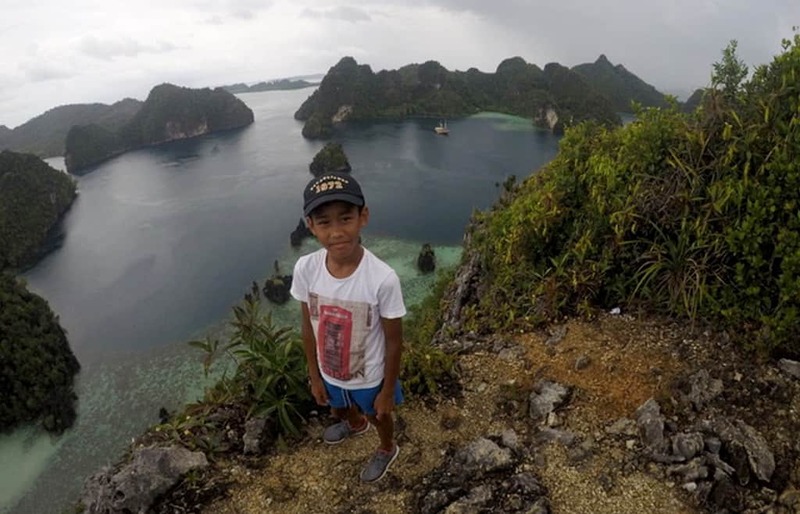 On our trip we started at Kaimana then sailed to Sorong stopping at Namatote, Triton Bay, Aiduma, Momon, Karas, Fak fak, Daram, Boo windows, Tank rock and Whale rock, Wayhil and Farondi and best of all THE CAVE although we couldn’t go to all the places that we were going to because of the storm so we went to different places instead. Even though it wasn’t our original plan it was still terrific. On the boat was captain Mark, Alex our cruise director, Doctor Lawrence Blair and his wife Ali and Carolyn the photographer, Scott, Dave his father and their friends Pete and Terence, then it was my family was I and my dad my brother Simon his girlfriend Christina Uncle Mike my cousin Jazz and Nicky and Arndt, and then there was Veronica and she was friends with everybody and everybody got on really well and it made a very happy trip. We started practicing our first dive expedition so then we could be used to the dive and I went with the snorkelers because we didn’t have a certificate for diving. After that we started to do more diving then they took us to Namatote to swim with three really big whale shark so then we can enjoy the trip. We snorkelled every day and we saw pretty amazing things including a bump head parrot fish, cuttlefish, pufferfish, lobster, octopus, sea snake, shark, dolphins ( melon head dolphins ) (Bottle nose dolphins ) ( common dolphins ), reef manta ray, hawks bill turtle and lots and lots of magnificent tropical fish. As well as lots of snorkelling we even had other fun activities like kayaking boat cruise volley ball swimming at a water fall and doing a hike also swimming in a big cave and also stand up paddle boards. Everybody agreed that the whale sharks were the best thing on the trip. Things we all really enjoyed is baby shark beach, bat island, driving the speed boats, seeing the manta ray, the bar at Sorong, hiking up the waterfall, the anemone garden with clown fish, the first night dive, winning lots of round of monopoly deal, playing card games with Tom, getting coconuts from the beach, seeing horizontal bolt of lightning, reading and diving, diving with Scott, and Terrences 30th birth day. What I will remember of this trip is the strange rocks that got turned into sharp rocks because the acid in the rain and the whale sharks definitely that and seeing the dolphins for the first time and coming aboard the seven seas. in fact the trip was so good I keep on thinking of it and I can’t wait to come back again sometime later.